We can't wait to welcome Susan to the shop on April 8, when she'll sign copies of her book and visit one-on-one with readers and fans. Pre-order your copy of The Matriarch now, then check out our exclusive Q&A with the author below. We touch on the former First Lady's childhood, her life in Texas, her penchant for a good murder mystery, and more. What drew you to Barbara Bush as a subject? Can you tell us a bit about the research involved in writing this biography? I’ve covered 10 presidential elections and interviewed nine presidents. During my first national campaign, in 1980, the very first presidential candidate I ever interviewed was George H.W. Bush. Later, I covered both Bush presidencies, for Newsday and then for USA Today. It was obvious to all of us in the White House press corps that Barbara Bush was an important and formidable figure for both her husband and her son. She was smart and funny and caustic—and, I thought, underestimated. She was more complicated than most Americans thought and more influential than just about anybody acknowledged. I wanted to tell her story. I set out to do that by interviewing her and anybody else who would talk to me, and by exploring the archives at the Bush 41 Library in College Station and elsewhere. I ended up spending a lot of time on Southwest Airlines, flying back and forth to Houston! Many places play a role in Barbara Bush's life: West Texas, Houston, and Maine to name a few. What made those places so important in her life and were there other places that played a large role? You have to start with Rye, the New York City suburb where she grew up during a remarkable time—during the Roaring Twenties and the Great Depression and then the onset of World War II. She saw the Hindenburg fly over Long Island Sound, and Amelia Earhart lived in the neighborhood. That said, Barbara Bush really did love Texas, where she declared her independence and raised her sprawling family. Of course, Kennebunkport was a retreat she treasured, a place where she took charge of her grandchildren—and everyone else. In an interview I did with her in December 2017, she had just started a new medical regimen and was hoping she could make it to Maine again, even if she would have to rely on her walker to get around. “I want to go back to the beach and push the cart,” she said, almost wistfully. But that was not to be. She would pass away four months later. What's one of the most surprising things you learned about Barbara Bush during this project? As a biographer, you’re always looking for the key moment, the defining event. When I started to do research, I thought that would be George Bush’s election to the White House in 1988. But that assumption turned out to be wrong. The defining moment for Barbara Bush came much earlier, in 1953, when her three-year-old daughter, Robin, was diagnosed with leukemia, a disease she had never heard of before. The brutal six months that followed shaped everything from her impatience with prattle to her views on abortion. What are some of your favorite recently published books? Can you tell us a bit about the project you are currently working on? I’ve started to work on a biography of House Speaker Nancy Pelosi, titled Madam Speaker. 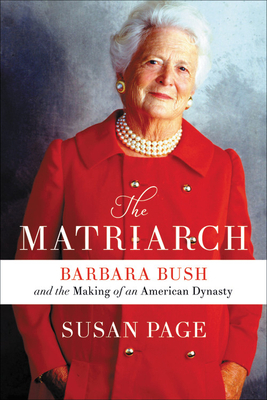 Now, she and Barbara Bush are different in many ways. But they share a certain fierceness. And I think both of them have made a difference. Author photo by Robert Deutsch.